Adjustable mattresses are a great way to stay comfortable while in bed without having to lay completely flat. Electric adjustable beds work so that you can elevate your head or feet by using a power control. You can also raise your feet and your head at the same time for zero gravity. You don’t have to settle for one option all the time. Some days you might want to elevate your legs or sit upright. Adjustable sheets, beds and mattresses are commonly thought to be used only by the elderly or by people who are recovering from a surgery. In reality, these beds can be very comfortable and relaxing for people of all types. The options you have as far as positioning yourself are nice, but you need to find a mattress that is just as cozy. Of course, you need to make sure that your adjustable bed has a comfortable mattress that comes with it. Luckily, since these beds are meant to be comfortable, this shouldn’t be too tricky. We’ve gathered up a few of the best adjustable mattresses. First, let’s take a look at some of the most important factors to keep in mind when shopping for a new adjustable mattress. Then we’ll show you our top adjustable mattress picks! What Should I Consider When Shopping for an Adjustable Mattress? It’s worth noting that you should figure out what’s most important to you personally. These are just some ideas that can help you to prioritize what you should be looking for in an adjustable mattress. In reality, it will come down to what you feel is necessary to have in an adjustable mattress. Be sure to create a list of your top priorities so that you know exactly what to be looking for when you begin shopping. Price: Price is a big concern for many people. The idea of having an adjustable bed in your home might sound expensive enough as it is. Because of these, people sometimes just go for the least expensive option or don’t look into too many considerations. Fortunately, the cost of adjustable beds and mattresses is decreasing. Because of this, more and more people can have these in their homes now. For some people, the price tag on these beds is just too much. Using online shopping tools is a good way to find high-quality adjustable mattresses for lower prices. Take advantage of sales and be on the lookout for coupons or free shipping! Before you begin shopping, it’s a good idea to look at a few of your options to get a reasonable price range. Then you will know how to budget accordingly. Warranty: Warranties are an important part of any major purchase. When you buy something that might be big or expensive, you want to make sure that it’s going to last. Additionally, you want to know that you’re protected in case anything happens. Given that these beds come with electronic controls in them, you never know what could go wrong. This is why it’s important to look for a mattress with a good warranty. These will be helpful if your mattress stops working. Plus, they will give you a peace of mind about your purchase. Size: Since adjustable mattresses come with their corresponding beds, you won’t need to worry about making sure they fit. You do need to make sure that the adjustable bed will fit in your space. Some folks like to put adjustable beds in front of the TV or in a living area so that they can relax throughout the day. You just need to be sure that it’s going to fit where you want it. Additionally, you will have to choose a bed size. These are your standard twin, full, queen, and king options. Not all adjustable beds come in all of these sizes though, so you will have to be a little bit more flexible there. Speed: Some adjustable beds can take a few moments to get you up or down. This isn’t a bad thing, but it could get old if you would like to sit up or lay down quickly. If speed is important to you, look for a bed that can move a little bit faster. Some folks do like the slower options too, so it’s really your personal preference. Material: You have a few options when it comes to the type of mattress you’re buying. They are all made up of different materials, and some are more comfortable than others. If you have had a memory foam mattress before and liked it, you might want to get a similar kind this time. If you don’t know what material you would like, go for a mattress that has a medium firmness. This is great for most users. It usually isn’t too plush or too hard. You can also take a look at reviews so that you know how each mattress’s material feels once you’re going to sleep! We’ve looked at plenty of adjustable beds and mattresses. Now we have narrowed it down to the five best adjustable mattresses. These are sorted into the order that we think that they deserve, but any of these adjustable mattresses are a great choice! You should be comfortable in any of them that you decide on. Be sure to keep the previous factors in mind when you’re looking at the specific mattresses that we like! This will help you to find one that you like too. The DynastyMattress S-Cape 2.0 is our favorite adjustable mattress available. 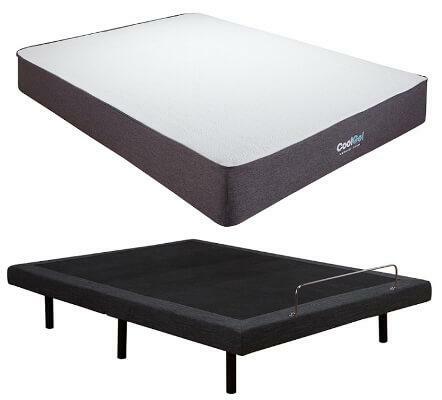 It has everything you could need in an adjustable mattress and it functions effortlessly. It’s extremely quiet so you don’t have to worry about disturbing a partner or anyone down the hall. Both the head and feet lift up so you can switch to zero-gravity if you would like to. It comes in both king and queen sizes. This particular mattress is a split king or split queen type. It splits down the middle so that each sleeping partner can adjust the bed how they want to. Because of this, it comes with two remotes. Another plus is that it can lift up to 850 pounds. It’s 12 inches thick. It’s made of gel memory foam, visco-elastic memory foam, and AirFlow base foam. This combination makes for a very comfortable bed. It has been excellent at curing many users’ pain. This mattress is priced reasonably for what it is. Adjustable beds can cost you a lot of money. This price won’t work for everyone though. The warranty information is unclear, but it’s between 25 and 30 years. 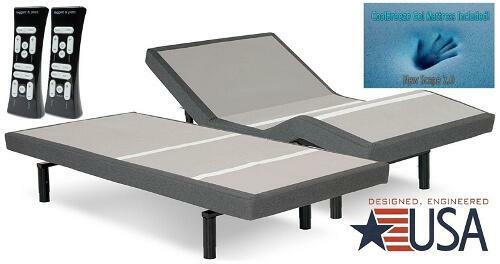 The Leggett and Platt Prodigy is an excellent choice if you’re on the lookout for the best adjustable bed. It’s very advanced compared to the others on the market. It’s got some great technological features built in so you won’t be missing out! This bed is considerably less expensive than the previous option, but it still performs just as well. It can even be controlled via a smartphone app. Some of its other features include memory buttons, snore stop, alarms, and more. If you’re looking for features like these, the Leggett and Platt Prodigy is the one for you. It comes in a variety of sizes, including split options. This is a very quiet mattress, which means your sleeping partner won’t be disturbed if you need to readjust throughout the night. It also has a massage or vibrating setting, but it can be noisy. This mattress has a 10-year in home warranty. It also has a 25-year complete warranty. You should be covered for most necessary repairs, if they are needed. 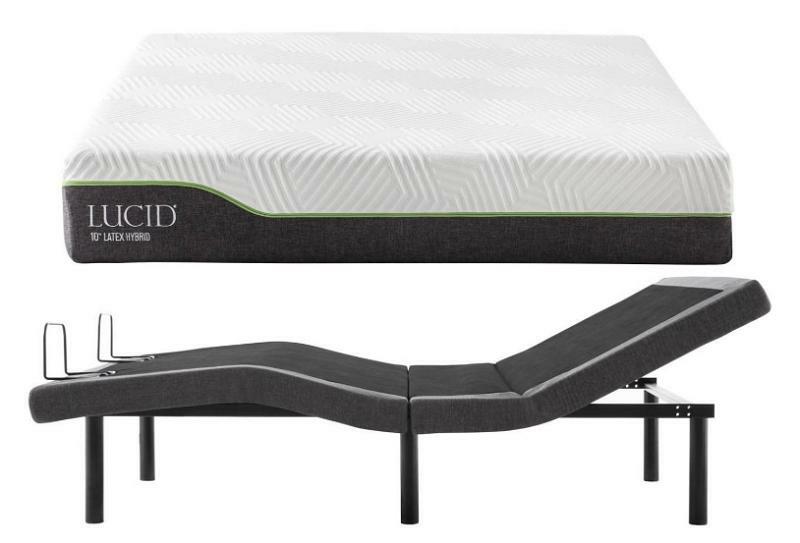 The Lucid L300 includes an adjustable bed base and a latex hybrid mattress. You can choose between a 10-inch option and a 12-inch one. This mattress also comes in a variety of sizes. It comes with a 10-year warranty against manufacturer defects. 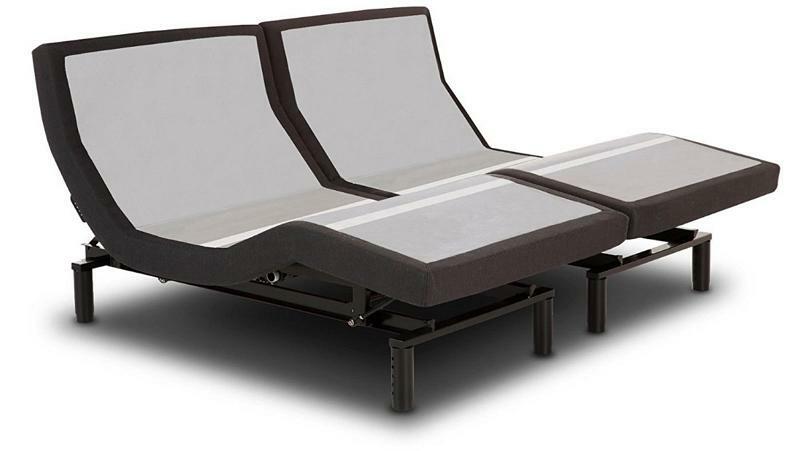 This adjustable bed even has USB ports at the head of the bed, with one on each side! The remote control for the bed is wireless as well. Keep in mind that Lucid makes more affordable mattresses than many other companies, but this won’t cause a compromise on quality. 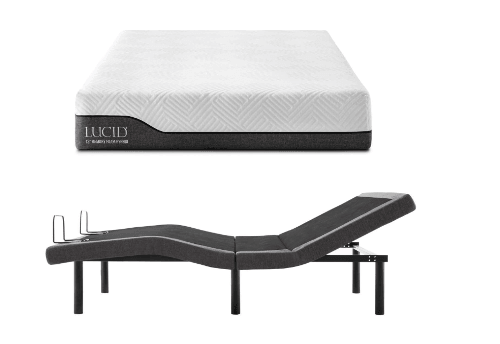 The Lucid L300 is a little bit louder than some of the other adjustable bed options. The Classic Brands Cool Gel Ventilated Mattress is one of the lower cost options if you’re on the search for an adjustable mattress. It includes an adjustable base and a mattress for a pretty decent price. It comes in a range of sizes. It’s 10.5 inches thick, which is pretty comfortable. It’s made of memory foam and gel. It’s ventilated too. The base is very quiet when it’s in motion, so you don’t need to be concerned about waking your partner. Additionally, it has a wireless remote. The USB ports are a nice addition! Another plus is that the legs are adjustable to several different heights. One downside is that the mattress may not be as durable as other options out there. Still, we think it’s a great value. Classic Brands doesn’t advertise a warranty, but they do claim to have great customer service! The Signature Sleep Memoir comes complete with both the base and the adjustable mattress. The base itself is very durable and the mattress is very comfortable. This combination is powerful! It comes in a range of thicknesses from 6-inch to 12-inch. There are also a few different sizes to choose from. Some users have experienced issues with the mattress expanding, but this isn’t always the case. The company hasn’t published any warranty information, so it is unclear whether there is a warranty. The remote control is wired. Both the mattress and the bed itself are very quiet to adjust, which is nice! As you can see, there are tons of great adjustable mattress options. We’ve selected just a few of our favorites that we think will work for most users. Of course, as you shop for an adjustable mattress, you should look for one that will work best for your specific needs. Keep in mind that our number one choice won’t be the best option for every individual. It all depends on your preferences and expectations in an adjustable mattress. You can’t go wrong with any of the mattresses that made this list. They’re all great choices and should give you a great night’s sleep. If you can’t make a decision, opt for the DynastyMattress S-Cape 2.0. It’s our personal favorite for a number of reasons, as mentioned before. We think you will love it too! We’re huge fans of the affordability of it and the lengthy warranty. When you’re purchasing a new mattress of anytime, be sure to read reviews and get plenty of information so that you can make an informed decision. Your sleep is an important part of your lifestyle, so it’s essential that you’re able to get a good night’s sleep. An adjustable bed is just one of the ways that you can improve your sleep!